Boundary walls, jumped by intruders, are the easiest points of access onto your property. For an intruder to never gain access beyond the pavement bordering your property wall, is the best way to keep yourself, family, house and belongings safe and secure. You can also never rely on your neighbours’ perimeter fence security. Here are 8 great tips to pimp your perimeter walls to prevent illegal access to your property and worse of all harm to yourself and family. 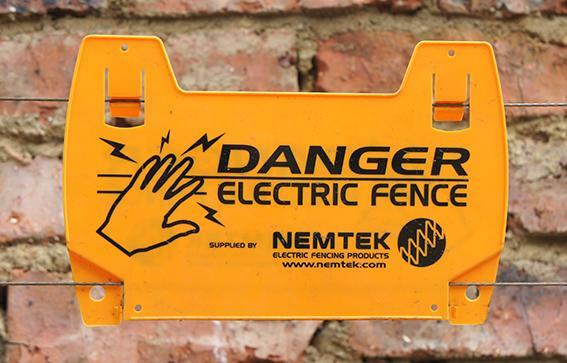 The threat of a very unpleasant shock while trying to jump your wall and touch the electric fence wires should be enough to deter an intruder trying to gain access to your property. Unfortunately we notice that an electric fence shock alone is not enough to deter determined intruders and they will continue to attempt to slither under the lowest wire. This is where metal security spikes or flat wrap add an extra layer of protection. They make walking on the wall and crawling over the wall more difficult for the intruder. Even more determined intruders will attempt to avoid the metal security spikes by lifting the wires up using a V shaped stick in order to jump your perimeter wall. Earth loops prevent electric fence wires from being tampered with by setting off an alarm if a wire is moved no more than 2 cm. An electric fence alarm, preferably linked to your armed response company, will be activated if any of the wires are tampered with, via the earth loops. Your driveway gate and paedestrian gate are the second most vulnerable point of entry onto your property. Anti lift brackets prevent your drive way gate from being lifted vertically in order for it to be lifted off its rail. A gate alarm is permanently on until a resident uses their remote to open the gate. The remote bypasses this alarm for a set time for the gate to open and close. If the time is expired and the gate is still open the alarm will go off. If the gate is forced open the alarm goes off as well. So without the touch of the residents remote any alteration on the gate will go into alarm. If the gate is kept open for longer than its normal duration which is approximately 30 seconds the alarm goes off. The alarm can be wired into the house alarm system thereby linking armed response. CCTV allows you to visually see who is lurking outside your driveway gate or on your pavement and next to your boundary wall. It allows you to call in your armed response patrol vehicle to unnerve the potential intruder away from your perimeter fence. This month load shedding, ageing infrastructure, cable theft and a cyclone are making for the perfect electrical storm. We are being battered from four different angles at the moment in Johannesburg. Load shedding is the most predictable power outage in South Africa at the moment. Using useful apps such as “eskomsepush” from Google’s playstore and being flexible, we are able to plan our lives around the load shedding schedules which last for 41/2 hours. Our gate and garage motor’s battery backups can cope with this duration of power outage. Unfortunately our load shedding periods are being extended due to derelict infrastructure of our electricity supply. When a phase of load shedding is over, the grid experiences a massive power surge when switched back on. The aged cables are just not able to sustain the surge. “This cable is older than I am,” said the City Power supervisor in charge of replacing the old cable on Tana Road in early March. It caused huge parts of Emmarentia to be without electricity for more than 24 hours. Substations around Johannesburg are struggling to keep the lights on. Thirdly, overhead copper cable theft is rife during load shedding as it is a safe time for the thieves. Any 'repair' activities taking place during load shedding are illegal and should be reported to 011 490 7900/7911/7553. Fourthly, the Cyclone Idai caused severe damage in Mozambique, damaging pylons and transmissions line. This consequently affected 900 MW of power supply to Eskom, also contributing to Eskom having to implement severe load shedding schedules in Johannesburg. During these extended periods of load shedding your gate or garage battery backup may very well not be adequate and you may have to revert to a manual setting. It is not safe to go out in the dark and open your driveway gate manually. Gate Repair Services therefore recommends installing an extra 40AH battery backup to keep your gate or garage motor on during loadshedding. An ant infestation may be the cause of your driveway gate motor or safety beams having gone on the fritz. Take a look under the covers! Ants are the biggest culprit when it comes to invading outdoor electronics. Ants nest in soil, in wood and are also opportunistic nesters. Your outdoor home electronics such as gate motors and swimming pool motors may very well become a choice of shelter for soil ants and opportunistic nesters. Opportunistic nester ants will build an ant nest anywhere that provides shelter, water and access to food. Soil nesters live in shallow, underground tunnels. During heavy rainstorms these nests flood, forcing the ants to search for higher dry ground like your gate motor or safety beams covers. There is also a theory that ants are attracted by the electromagnetic fields in switches hence their attraction to them. It also appears that termites may enjoy chewing on the plastic insulation of electrical wiring equally as wood. Once the ants invade, they leave a scent trail that allows them to return to the nest and establish a colony where ant food, eggs and larvae are housed. These colonies can begin to cause havoc with your electronics making them short circuit, preventing them from turning on and leading to repairs. Often the switches inside them need to be replaced. When the ants enter the electronic parts connections are created with their bodies and the electrics, causing circuits to short out and electrocute the ants. A pheromone, a scent ants use to communicate that they are "under attack”, is then released. This attracts more ants to the colony compounding the ant infestation problem. Other insects that can cause disruption to your outdoor electronics include wasps. Wasps like locations that are left undisturbed like your covers and motors. Treat the wasp nest at night when all the workers and queen are present. They are also less aggressive at night. Cockroaches are the next suspects. They search for warm and dark spaces, such as your gate motor cover, to lay eggs. Their excrement can corrode circuit boards and short out electronic components. In order to rid your outside electrical components of a cockroach or ant infestation try blowing those pesky invaders out of all the nooks and crannies first. To avoid damage to your circuit board rather use an insect bait such as ant traps, as opposed to an insecticide spray for ant and cockroach control. Have you got a faulty or broken gate or garage remote control and need to replace it? First choice would be to replace your remote control with the exact same brand and model as you had before. The same would go for a lost gate remote control as well. If the remote control is no longer being manufactured you can then use a similar remote control on the market that has the same features as your broken one. DIP switch – A DIP switchis a manual electric switch which is designed to be used on a printed circuit board along with other electronics. It can then be customised to a particular electronic device. Learning remote: A learning remote can receive and store codes transmitted by another remote control via radio frequency; it can then transmit those codes to receiver that can read them. Many garage door opener remote controls use fixed-code encoding which use DIP switches or soldering to do the address pins coding process, For these fixed-code garage door opener remotes, one can easily clone the existing remote using a self-learning remote control duplicator (copy remote) which can make a copy of the remote using face-to-face copying. Secondly unfortunately these frequencies are easily copied if someone gets hold of your remote control. All they have to do is open the remote with a small screw driver and take a photo of the pin pattern and then duplicate it into a new DIP switch remote control. New generation remote controls use something called a hopping code or a rolling code to provide security. This is the safest type of remote control for your gate or garage door as the frequency can only be set from the receiver that is attached to your gate motor. Your gate motors should always be locked and protected by an antitheft bracket. Home security intercom adds an extra level of security to your home whilst living in these times in Johannesburg. Both hard-wired and wireless intercoms are available. But be careful when you are improving the security of your home that you are not decreasing the safety of your home. When installing a new gate or garage motor, a hard wired intercom or an electric fence the wiring of all automation motors, intercoms, and electric fences need to be compliant with the electricity regulation board, known as the ELECTRICAL CONFORMANCE BOARD South Africa (ECBSA). Here is an example of a non-compliant installation of an intercom by a dodgy installer. The cable is exposed to weather such as rain and UV exposure and mechanical forces such as bending and kinking. Correct home security intercom installation of a hard-wired intercom includes the wires in conduit (An electrical conduit is a tube used to protect and route electrical wiring in a building or structure) and no joints underground. This prevents water from seeping onto the electrical wires. Conduit piping also prevents wires from being damaged by kinking or bending. All this can cause an electrical short. An electrical short allows the electricity to pass through a path of least resistance Less distance between the two points means less resistance, which means your short circuit will produce more heat and result in fires. If you accept work like this from a contractor you are compromising the electricity compliance of your house as set out by ECBSA. This contractor was clearly taking short cuts in doing the work and putting the homeowner at risk. The homeowner is responsible for compliance, not the contractor. If a fire is to develop due to the non- compliant wiring of your home security intercom and causes damage to your house. your insurance may very well not pay out. So do not compromise your home safety – choose a reputable intercom installer such as Gate Repair Services. In order to install an electric fence between the wall or fence separating your property from that of your neighbor you do need to ask for permission to install an electric fence. Since it will improve both your own security and their own this is generally not a problem and you will even find separated walls and fences with two rows of fencing. This double fencing actually increases your security since you do not need to rely on your neighbor to ensure their fence is working and properly maintained to be assured that your perimeter is secure. With security being such a big industry it's no wonder that the market is saturated with one-man do-it-all shows who claim to have the best products, the quickest turnaround times and the lowest prices. When it comes to electric fences it can, and very commonly, be done WRONG. When looking for a company ensure that you choose a well-established firm that has at least 2 to 3 teams of technicians out in the field. They should have a landline number that is answered professionally and a website where they include a physical address. Apart from the obvious such as the electric fence wires and the wall-top brackets which are mounted atop your fence or wall you should know about the other components which work together to make your electric fence system function. This includes the energizer which is one of the most expensive parts of the system and converts the electrical power from your mains into electrical impulses with high voltage. Also important is the battery back-up system which will keep your fence working in the event of a power outage, lightening diverters and sirens to alert you in the event that the fence is tampered with. For a residential property an electric fence system will typically incorporate 3-5 earth spikes but many of the less professional companies and one-man-shows out there will take their chances in an effort to get the job done cheaply and quickly. You must insist that the company ensure there are a minimum of 3 earth spikes or as many as they recommend for your property. Earth spikes are essential to ensuring that the fence is not easily hit by lightening. You may have seen some strange looking metal loops between wires on electric fences and wondered what in the world they do. Earth loops add an extra layer of security to your electric fence and perimeter. Earth loops are placed between three wires on an electric fence to ensure that they cannot easily be separated or tampered with without setting an alarm off. If the central wire which rests in the middle of the metal loop makes contact with the loop it will cause an interruption in the electrical flow and set an alarm off. It does not have to move more than 2 cm. You should insist that the electric fencing company install anti-separation loops on your fences - especially if your fence has less than 5 wires. This is an electric fence without earth loops that has been tampered with. Note the branch that was used to create a space between the wall and the wires for the intruder to climb through. Keeping your fence up and running during load shedding or a power outage is absolutely critical since it is during this time that burglars and home invaders wander the streets looking for easy targets. A 12-volt battery will be sufficient to keep your fence running for at least 6 hours which is certainly enough time to pass scheduled load shedding. Some batteries can last up to 10 hours. Most energizers come standard with battery back-up. Government regulations require that an electric fence in any residential setting not carry more than 9900 volts. This is a fairly decent limit which is guaranteed to incapacitate and fend off any attack or attempted breach but is considered non-lethal. The electric fence company conducting the installation should be able to tell you what the voltage output of your fence is and if it's below this limit you need to find out why and insist on adjustments. Electric fences are deemed pet friendly because they are too far up for dogs to reach, are avoided by cats and cannot shock birds because they are not in contact with the ground (which is required for an electric shock to be delivered). To be more specific, cats can instinctively sense the electric current running through the wires and will avoid making contact with the fence and when it comes to dogs they will be unable to reach so high up as to make contact with the wires. Although most people don’t really consider their electric fence as a system that needs maintenance you will have to perform regular tasks such as trimming down trees and bushes which are touching the fence and conduct regular checks to ensure that the system is up and running the way it should be. This can and probably should be done by a professional on an annual basis who must check to make sure that everything is in working order and that the radio transmitter is able to send an intrusion detection signal if there is any interference. If the wires are corroded, they need to be replaced. If you're not home and someone attempts to breach your exterior perimeter the load siren can go on for hours without anyone doing anything about it. This is why it's always a good idea to connect your electric fence to your home's alarm system and to a security company. This will ensure than any attempted breach will be dealt with quickly and efficiently whether you're at home or not. The heart of an electric fence system is the energiser (power unit). The electric fence energisers a necessity. This box is filled with capacitors that store the charge. The electric fence charger (energiser) converts mains or battery power (240 volts) into a high voltage pulse (non-lethal shock). It also controls its movement down the wires, every 1.5 seconds. Energisers have a low energy consumption and you will not see any noticeable increase on your electricity bill. If you are using a battery as power, keep in mind that the battery needs to be replaced every 2-3 years. Also keep in mind as the battery looses charge, so does your electric fence. It is a lot more convenient to run off mains. For an electric shock to occur, the current must complete a full circuit, as in diagram for electric fence. When a grounded person touches the wires of the fence, the electric fence circuit is complete. Electricity flows through the body and back through the ground to the earth, to return to the terminal of the energizer. It is at this point that a person receives a shock from electric fence and hopefully has experienced enough discomfort to lose interest in trying to climb over your wall. An electric fence will only work if the electrical wiring is earthed. Gate Repair Services technicians have seen unearthed electrical fence installations by previous installers, much to the customer’s horror! So make an electric fence part of your security system. For a professional installation of your electric fence, call Gate Repair Services. Maintenance of your garage door and garage door motors is extremely important to avoid your garage door from not closing, hence compromising the security of your home in Johannesburg. Well maintained garage doors equal optimally working garage door automation. Unfortunately the motor is not there to compensate for a poorly mounted, unbalanced or damaged garage door. This will just cause damage to your garage door automation as the motor has to deal with unaccounted forces. If you cannot open and close your garage door manually without it sticking or jamming – do not use it on automation mode. A tip to check the balance of your sectional roll up door is to release it from its automation and then close it, resting on top of a bathroom scale that is placed in the centre of your door. It is well balanced if it does not exceed 15 kg on the scale. All moving parts such as hinges, pivots and rollers of your garage door should be oiled to prevent rust build up. The main pivot pin carries the most load. Therefore bearings must be lubricated regularly to maintain smooth gliding. On a tip up door, springs should only be replaced by a professional. Potentially it is a dangerous operation as the springs are under great tension, which can result in harm to person and property when released. For aluminium garage roll doors, use a teflon or graphite spray in the guide channels for smooth movement of the door. Do not use a silicone spray or grease as this builds up grime, causing friction. Wooden doors need to be regularly sealed and varnished with a hardy product for UV protection. Wooden doors left exposed to the elements become warped and unbalanced. Not only do you need to keep your garage doors well maintained, you also need to keep your automation well maintained. If your garage door motor has been correctly installed by a reputable installer such as Gate Repair Services, minimal maintenance is needed on your motor. What you will need to do every 3 months is lubricate the worm shaft. Please ask your installer which lubrication brand is recommended, as using something not recommended could end up causing serious and possibly permanent damage to your motor. If you have this all in order, you will not be inconvenienced by a garage door that will not close. Intercoms are there for visitors to alert you to their presence and to allow you to identify them and let them in if you so wish. They can also be used to communicate between rooms and even different buildings like staff quarters. You can find intercoms commonly outside homes. You get house intercoms and/or wireless door intercom system. Tandem intercoms work in series from room to room. Intercoms for home use are the biggest seller. But business intercom systems and office intercom systems are also now growing in popularity. Most homes have drive through intercoms for security reasons. Old fashioned wireless home intercoms are very basic and not recommended. Intercoms, cordless intercoms and intercom door chimes are available to alert you to the presence of visitors and to allow you to identify them and let them in if you so wish. With regards to camera intercom phone systems with intercom cameras, there are many different systems available. Access control and security system helps staying one step ahead of criminals, which is always challenging. However one can implement many barriers that can make life more difficult for them. Most robberies that occur in offices, factories and homes are committed by opportunist thieves. By reducing the opportunity of a criminal gaining access easily into your place of work or your home, the criminal may just walk on by to an easier target. Gate security including a boom comes with many benefits including access control and burglar deterrent. These barriers offer an extra layer to the security of your business discouraging opportunist thieving from your business premises. You will easily recognise access control barrier security in most business premises car parks as an added feature to assist security guards in their work to stop criminal activity. Car park barriers can be either manual or automated rising booms and provide full restriction of the entrance and exit points to the business premises. When considering installing a security boom, it is worth considering which type of barrier would be the most suitable for your needs. There are manual rising arm booms, automated rising arm booms, manual swing gates, automated swing gates, pedestrian gates, manual and automated sliding gates. These gates can add an extra layer of security to the premises. It is not only business parks that benefit from barrier installation. There are also residential communities that wish to reside in gated communities such as townhouse complexes and life style villages. Booms with the reinforcement of security guards certainly reduce the risk of theft and crime in these gated communities. Having gated access reduces unauthorised vehicle access as well as paedestrian entry. This makes for a safer living environment. It has been proved that criminal elements are deterred by a barrier security gate as an access control measurement. This is because boomed access is a psychological and a physical barrier and the criminal does not like the thought of perhaps being trapped or slowed down. Add an extra layer of security to your business parking with a manual barrier such as the ET NICE 4 m.
Electric fence wiring will, over time, require maintenance and possible re-wiring. Therefore maintenance of your electric fence is critical. Its ability to work optimally is reduced by plants that are allowed to grow onto the high tensile wires. Always remember to switch off your electric fence energiser when you are trimming vegetation away from the wires. Wiring of an electric fence consists of high tension (HT) metal wires. Therefore when it comes to repairs of your electric fence wires, cable should never be joined along the length. Do not go for this cheap solution. It is recommended to replace the full length of the HT cable. This is due to the extended problems you can expect in the future with extra cost. Repairs of HT cables along the length are exposed to weather and rain and can cause false alarms. Secondly the joins are not sealed and if someone were to touch the join they will get a nasty shock. Use crimp ferrules to join the fence wire ends, with the same material that the wire is made of example aluminium. Aluminium is highly resistant to corrosion. IF you do use a different material for the wire and ferrules this difference in material can cause an electrolytic effect which can cause rust, leading to breaks in the electric fence wiring. Most electric fencing in Johannesburg is wall top type fencing. It is highly recommended, unfortunately due to our crime statistics, to install 8 strand electric fence wiring. Intruders can simply just step over anything shorter than this.